After hosting the first of two major sporting events it has been awarded this decade, Brazil has come well and truly under the global spotlight – or “sportlight” – in 2014. But this spotlight should not be focused solely on Brazil’s role in elite sport, SESC São Paulo’s Manager of Physical and Sportive Development and ISCA Vice President Maria Luiza Souza Dias says in our exclusive interview. Dias spoke to ISCA’s Roxana Chiriac this month about how Brazilian grassroots sport organisations are being proactive and using the increased attention on Brazil during the World Cup and Olympic Games to their advantage. These organisations are now also armed with compelling data from research SESC conducted at the beginning of the Move Brasil campaign in conjunction with Ipsos Public Affairs. Despite the country’s mega-event fever, over 50% of the population never participates in sport and physical activity and several social groups, including women and low income earners, lag well behind others when it comes to being active. The findings show just how important it is for these organisations to work together to tackle imbalances in physical activity across Brazil. Move Brasil is the perfect vehicle for that, Dias points out. “Campaigns that promote action and create opportunities to establish effective partnerships and cooperation are extremely important to our country, and this is exactly what the ‘Move Brasil Campaign’ does,” she says. 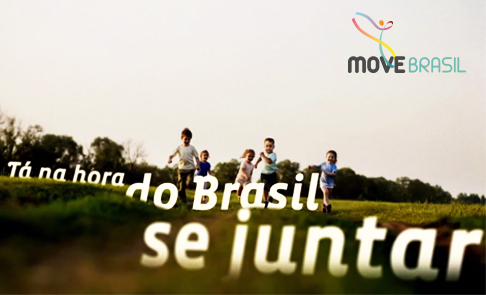 The Move Brasil campaign is in its second year and the Brazilian edition of MOVE Week will take place from 21 to 27 September. Find out how to become a ‘mover’ here. Q: At the Play the Game conference in 2013 you stated “We prefer to play our role well rather than criticise others. The Olympics and the World Cup are good opportunities to put sport on the agenda and to create working relationships with the sports organisations and other NGOs”? Have the working relationships between sports organisations been easier to create as Brazil has come under the spotlight? A: Yes, beyond doubt, the World Cup and the Olympics are motivating the organisations to look for partnerships and address issues related to sport development. Football in particular is on the Brazilians’ agenda. In addition, the world’s eye is turned to our country, expanding the possibility of developing international partnerships and projects. At the same time we are proud of the World Cup’s organisation and, as painful as the Brazilian National Team’s defeat has been, it highlights the fact that we not only need to invest in effective projects, but also to get inspired by good examples in the wider world to improve the structure of sport in our country. What happened on the football pitch is already creating a strong debate about the grassroots sport and it emphasises the need to create a positive scenario, something we are proposing to the Move Brasil Campaign. Q: The Move Brasil Campaign is the most comprehensive for grassroots sport yet in Brazil. Have you gathered more data on physical activity levels among the Brazilian population to strengthen the campaign? 1. More than half of Brazilians claim to have never practiced sports and/or physical activities. 2. Among female respondents, sedentary lifestyle has reached 71% (compared with 43% for male respondents). 3. The practice of sports and physical activity in general is a privilege of the people who have had more schooling, possibly due to their access to gyms and academies. 4. The practice of sports and physical activity is also more common among youths aged from 16-24 years than among older people. However, on examining a frequency of 3 times or more a week, senior citizens present indexes similar to younger citizens (17% and 18% respectively). 5. Social class and regional standards are verified in the frequency of practicing sports: The higher the social class, the greater the frequency of practicing physical sports. The Southern, Southwestern and Northeastern regions present similar indexes in activities practiced 3 times a week or more. It’s important to say that this work is still in progress and must continue until the campaign finishes. We are making a lot of efforts to conduct a comprehensive and deep survey. Besides that, a new report of Vigitel (Department of Health Vigilance of the Ministry of Health) is already available. Q: Have you set new specific goals for Move Brasil that you would like to see happening? A: From the survey results we have identified certain focus groups to guide the campaign’s actions. For example, women and the low-income population have been revealed as groups that need stronger action, as they shy away from physical activity. With these data we have managed to attract institutions that work with these groups, and we intend to disseminate successful cases and positive experiences throughout their networks. In addition, we aim for a greater range of activities and a greater number of “movers” [equivalent to NowWeMOVE’s MOVE Agents, ed.] to get involved in the Brazil Move Week and we look forward to seeing the impact of this on the national scenario. Q: How has the Move Brasil Campaign developed this year? Have you adopted new strategies? 1. Forward to the campaign manager a statement of the institution/company, answering the question, “Why does the institution wish to be part of Move Brasil?” They also send their institution/company logo and a photo for publication on the Move Brasil website. 2. Publish their commitments to our cause on their own communication channels and in the Move Brasil channels. It’s easy and at the same time very important, as it tells us how the institution can contribute to achieving our goals. 3. Actively participate in the Brasil Move Week (2014, 2015 and 2016). In 2014, it will take place from 21 to 27 September. From this systematised approach, we have managed to organise the new movers’ engagement in the campaign, which has contributed to the campaign’s growth. New movers have joined us for many reasons, from national to locally-based objectives. Q: Why do you think Brazil needs the Move Brasil Campaign? A: There are several factors that underline the need for us to develop Move Brasil. We are living in a sports decade in Brazil, so it’s important to take this moment to propose innovative scenarios for the national sports practice. This is an opportunity to build a network that deals with grassroots sports and sports promotion for the people, which is something that we don’t have at a national level. Also, the indicators of physical activity and sports practice levels are slowly improving, which is a signal for us to carry on with this work. Campaigns that promote action and create opportunities to establish effective partnerships and cooperation are extremely important to our country, and this is exactly what the “Move Brasil Campaign” does.